The U.S. Senate’s Select Committee on Intelligence, which is investigating possible collusion between members of the White House staff and the Russian government in Russia’s attempts to manipulate last year’s Presidential election, first learned about Jared Kushner’s use of a private email server from news reports… and they ain’t happy about it. CNN is reporting that the chair and vice-chair of the Intelligence Committee drafted a letter to Kushner’s lawyer requesting that the legal team for the President’s adviser and son-in-law double-check and ensure that they have turned over every relevant document to the committee. Here’s a copy of the letter obtained by CNN. Perhaps as interesting as the existence of the letter itself (and the peevishness of the committee chairs) is how CNN managed to get ahold of the document in the first place. The network received the letter from the Committee as part of a continuing flow of documents that’s being accidentally sent from someone called the “email prankster” (because the world is actually amazing). This prankster pretended to be Kushner and engaged in a fake email correspondence with Kushner’s actual attorney earlier, Abbe Lowell, earlier this week about some (nonexistent) adult content the fake Kushner alleged was in the emails he sent to the Senate Committee. 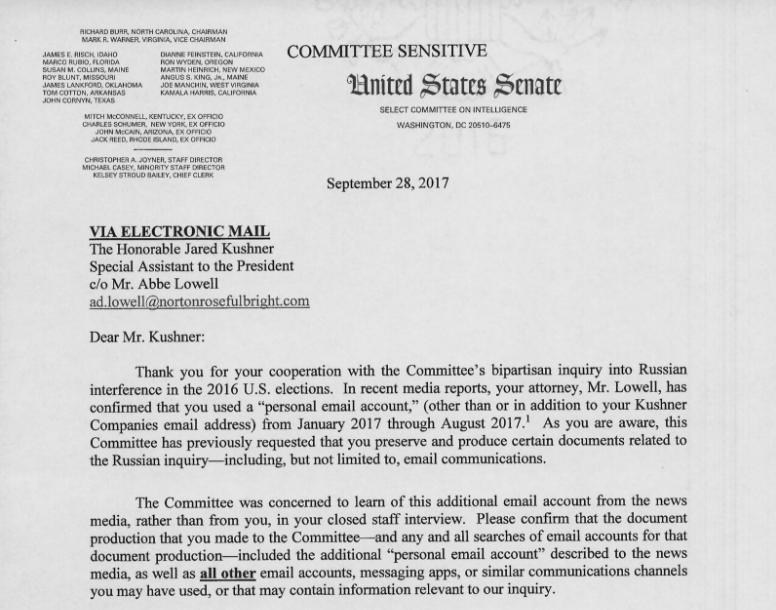 Earlier on Thursday, Lowell tried to forward the email from the Senate Intelligence Committee to Kushner and the fake Kushner’s email account auto-populated instead. Lowell then sent the email to the fake Kushner. Kushner has run afoul of Congressional committees for withholding information in the past. Including some 100 contacts with foreign leaders (including Russian officials).